The red carpet was blazing with cameras on Hollywood Boulevard for the premier of the two hour documentary film called The People’s Designer about American fashion designer Jeremy Scott. Before the film Jeremy Scott and Katy Perry cemented their handprints in history in front of Hollywood’s famous TLC Chinese Theater to join the likes of the Hollywood star elite. Jeremy Scott is the first fashion designer to have his hand prints added to the front of the TLC Chinese Theater next to the Hollywood Walk of Fame. The film revealed a whole other side of Jeremy Scott, who is a midwest country boy with a dream, born in 1974. His passion for fashion started at an early age. He always wanted to be somewhere where he felt he belonged, where he could express himself creatively. New York eventually became that place although now he resides in Los Angeles with his longterm partner and support system who he credits for his early rise of success. After being devastated about not getting into New York’s FIT with a rejection letter telling him he had no creativity or vision, he finally was accepted by his third school, Pratt. His journey as a young man leads him to Paris, the hub of the fashion world where he designed a fashion show around the theme of the movie “Crash” where he went to lengths to get one of the top Parisian fashion writers to come by personally, inviting her on a painted ripped off car door. Walking in behind the red carpet to the premier was like stumbling into a really fun Hollywood Halloween party where you just wanted to ogle everyone’s outfits and hairstyles. Everyone was wearing “Moschino” because Jeremy Scott became the new visionary or creative director to partner with the major fashion house in Italy. Moschino who created the label in 1983 died of AIDS in 1994. Franco Moschino, like Jeremy Scott, became famous for his innovative, colorful and sometimes eccentric – designs, as well as for his criticisms of the fashion industry and for his social awareness campaigns in the early 1990s. “I don’t speak Italian, but I do speak Moschino” reads Jeremy’s T-shirt in the film as he plans with his team for 6 months a 15 minute fashion show. We see how they decide upon the right models to wear the clothes, match music to outfits, order the clothes to fit the fashion walk flow, and make sure each outfit fits just right on the model. Jeremy Scott’s first Moschino fashion show is outlandish with a theme of fast food products, like the McDonalds “M” and colors tied to McDonalds, but with the “M” for Moschino. Girls flail down the runway with Dietary Labels printed on fancy gowns, Popcorn prints, and swiss cheese cracker silk sprawling dresses. One thing is certain. Jeremy Scott is lightening up and making Moschino FUN, in a Pop Art tongue-in-cheek sort of way. Although this fanfare is really reserved for the bravado of a fashion show, Jeremy Scott is known for his winged Adidas shoes, and his outlandish pop-culture style that can often be seen on the likes of Miley Cyrus, Katie Perry, Madonna, Lady Gaga, and major sports stars. Rita Ora, Lily Collins, Tinashe, Vanessa Hudgens all donned the red carpet in Moschino/Jeremy Scott that night. 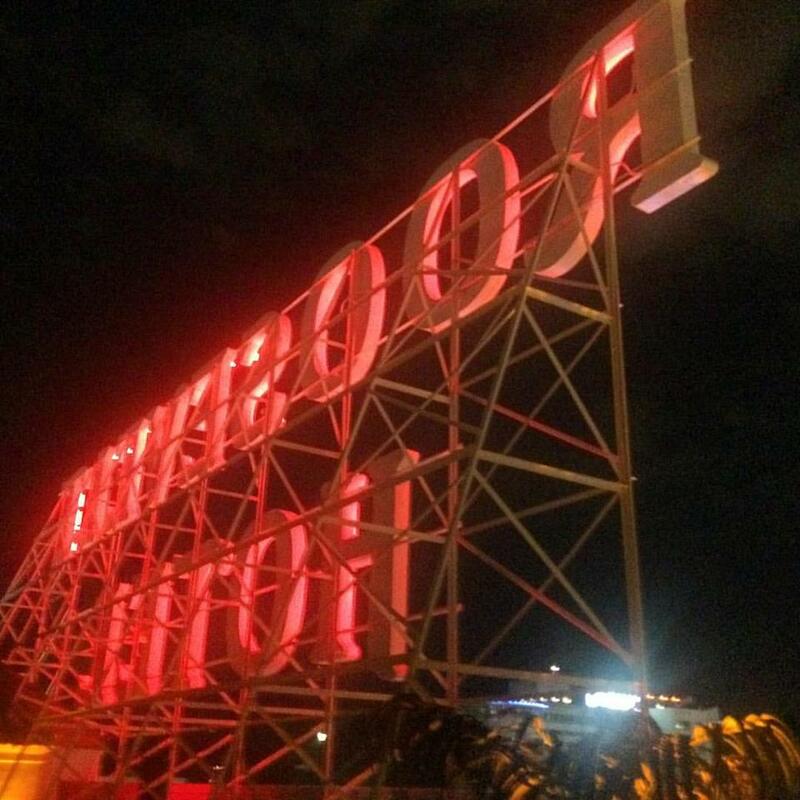 The after party on top of the historic Roosevelt Hotel in Hollywood with its glowing red rooftop sign was a perfect spot for an American icon. Katie Perry made the after party looking stunning in a classy black ensemble. The producers shared with us their desire to make the film and how they started filming years before Jeremy Scott became so well known. The producers are the same guys who created the Arnold Schwarzenegger/Mickey Rourke film now on Netflix called Generation Iron. For more fashion flair fun, check out @itsJeremyscott latest Instagram posts where he shares playful videos shot with Katie Perry dancing to tunes with some wild Moschino outfits. Whatever you feel about the pop-ish brand, Jeremy Scott is doing something right because every major celebrity is standing behind him, supporting his designs, digging his threads, and shouting it out to the world on social media. America has embraced a small farm boy who spent a majority of his life being bullied because of his originality. Congrats Jeremy Scott! Shine on! For more details about this memorable night, read Jasmin Rosemberg’s interview on Variety.